A sump pump typically located in a basement, and it is a pump used to remove drainage water that has accumulated in a collection basin. The water commonly enters the collection basin from the perimeter drains of a basement waterproofing system, and the source of the water can be either surface rainwater, or it can be groundwater if the basement is below the water table level. 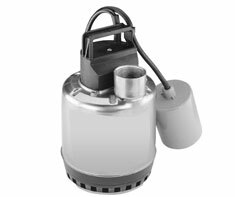 The way an automatic sump pump works is that when the water level rises, it pushes up a float that turns on the pump motor. As the water is pumped out and the float drops down, the pump motor automatically shuts off. Some sump pump systems have a backup battery so that the sump pump will still operate during a power failure. Another type of sump pump can be for toilets and plumbing which are located below the level where the plumbing drainage pipe leaves your home, and which therefore requires this wastewater to be pumped up to this higher level. When the sewer line level is above the basement floor, a sump pump is required for pumping the water up to the sewer line level. Shown in the 'Routine Care' section are the recommended routine maintenance tasks for your sump pump. The 'Q & A' section shows answers to common questions. And the 'Articles' section provides helpful articles about your sump pump.